The solar company Sunrun officially launched a new operation in Wisconsin on March 29, making it the first of the major national solar companies to offer service in the Midwest. The company has seven new employees working in southeast Wisconsin and plans to hire more than 50 within a year. Wisconsin has for several years been seen as a battleground over the future of distributed solar, with utilities and the Public Service Commission appointed by Gov. Scott Walker making various requests and decisions seen as hostile to solar development. Solar advocates and developers – including Sunrun – have repeatedly said the state was forgoing job growth and economic opportunity as a result. But popular, bipartisan support for solar is strong in Wisconsin, as evidenced by the turnout and public opinion offered in contentious utility rate cases. And Sunrun senior manager of public policy Amy Heart said that despite controversial moves by utilities and the commission, Wisconsin actually has some long-standing policies that offer a stable and promising environment for solar development. Amy Heart, based in Milwaukee, is the director of public policy at Sunrun. She added that a 2015 ruling by a state circuit court mandates the Public Service Commission utilize a data-driven process in making decisions on solar, a ruling which advocates can invoke in future disputes. Sunrun offers residential solar planning, installation and financing, selling solar panels outright and offering a loan program to help homeowners afford installations. In other states Sunrun leases solar panels to homeowners, selling them the energy through a third-party power purchase agreement, but this service is not currently offered in Wisconsin. Sunrun now serves 12 counties in Southeast Wisconsin, all in the service territory of We Energies, whose Wisconsin customers pay the highest electricity rates in the Midwest, making savings from solar potentially attractive. We Energies has also proposed the state’s most controversial rate policies regarding solar. Among other things, We Energies proposed prohibiting third-party leasing agreements but did not succeed. Midwest Energy News talked with Heart, who is based in Milwaukee, the day before the company’s official Wisconsin launch (transcript lightly edited for clarity). Midwest Energy News: What does it mean to say no other national solar companies serve the Midwest? Which companies are you talking about and is it actually impossible for people in the Midwest to get service from those companies? Heart: Financing is one of the biggest obstacles for solar. Before they literally could not get that service, from Sunrun or other companies. Customers were on their own, getting a bid or two and then going to a bank which might not understand solar. There’s a lot of legwork the homeowner has to do, a lot of hoops they have to jump through. We do that for them. Sunrun is in 16 states and Wisconsin is our 17th. We get put in the bucket with folks like Sungevity, SolarCity and Vivint. We are the first national solar company to serve the Midwest. We’re the leading provider of rooftop solar in the country, we’ve been a pioneer in that space, with a model that allows us to come into a new market. We do sales and our own installations, and also our business model allows us to collaborate with partners and companies on the ground, who have been installing solar in the state for 10, 20, 30 years. That allows us the flexibility to consider regions or markets that other folks [national companies] have not. We’ve heard many times over the past few years that Wisconsin political leaders and the Public Service Commission are hostile to solar and doing the bidding of utilities that are pushing back against the growth of distributed solar. Why is Sunrun choosing Wisconsin as the place to launch Midwest operations? Has something changed recently making the climate in Wisconsin more amenable? The biggest concern that faced the solar industry in Wisconsin was the proposal before the Public Service Commission in 2014 [from We Energies] which would have allowed discriminatory fees on solar customers. 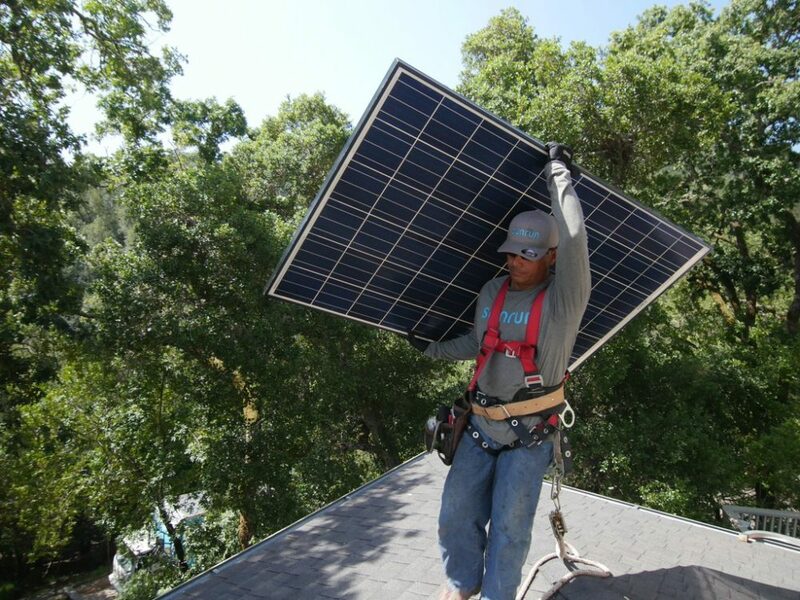 Sunrun was one of members of The Alliance for Solar Choice which challenged that in court. The solar industry received a favorable outcome where discriminatory fees were overturned, and the decision reiterated that any proposal related to rooftop solar and customer-generated power needs to be data-driven and fact-based. The framework for a strong rooftop solar market already exists in Wisconsin. Wisconsin has always been a leader in creating that framework and creating common-sense policies that drive rooftop solar generation. In the past, advocates partnered with Republican Gov. Tommy Thompson to usher in nation-leading policies. Wisconsin was one of the first states to have a rule that created a stable interconnection framework; and Wisconsin is one of the only Midwestern states to have state solar incentives [through the Focus on Energy program]. Even during all of those issues at the Public Service Commission, that framework has stayed in place. And as costs have come down in the solar industry, solar is now viable for more people in more locations. We’ve had a record increase in solar jobs in Wisconsin; from 2015 to 2016 solar jobs increased 45 percent. That’s an indication there’s definitely an appetite for solar in Wisconsin. We want to be here standing next to the ratepayer advocacy groups, the solar industry, making sure the foundation stays solid and that we’re moving forward to an even stronger solar future. Right now you are not offering leasing or third party ownership in Wisconsin. What needs to change in order for Sunrun to do that? What the solar industry really benefits from is having a stable environment. There’s interest from a wide variety of individuals and stakeholders in increasing the financing tools to allow more homeowners and more businesses to add solar. We want clarity on the leasing, we hope we can clarify that sooner than later in Wisconsin. We’re not questioning whether or not it’s allowed, there’s case law that clearly states it is allowed. We just want it clarified. Who has the power to clarify the leasing issue? There are several options, but the easiest and cleanest way would be a state statute saying third party owners are not considered utilities. Are there other things you’d like to see utilities, the legislature, or the Public Service Commission do to facilitate solar development? Certainly other states have shown a commitment to rooftop solar and seen it as an opportunity to be a job creator, we’d love to work with policymakers on that [in Wisconsin]. The opportunity here is very similar to the opportunity in South Carolina, which a few years ago allowed net metering for the first time, and explicitly said leasing is okay and added incentives. And the market bloomed. We hired nearly 200 employees in South Carolina — that’s the scale of what could happen in Wisconsin. Certainly [state leaders should be] maintaining a stable policy environment, having that fair process at the Public Service Commission and not having the potentially disrupting rate cases with unnecessary fees on solar customers. Will Sunrun also do work in nearby Illinois, especially given Illinois’ new energy bill with big incentives for solar? With this entrance we do hope Sunrun will be a leader in the Midwest. As we pioneer access to rooftop solar in the region, we’re not looking at Wisconsin in a silo by itself, no pun intended. It goes to Sunrun’s commitment to working on policy issues, investing years getting to know stakeholders, getting to know the policy framework of what works best in Illinois, what works best in Michigan. We have no timeline but that’s certainly what we hope, to be looking at the entire region. We’re in this for the long haul. A recently appointed Public Service Commission chair faces a confirmation hearing Tuesday in the state Senate. Eagle Point Solar president Barry Shear says he’s prepared to take his case to state’s top court to clarify rules.